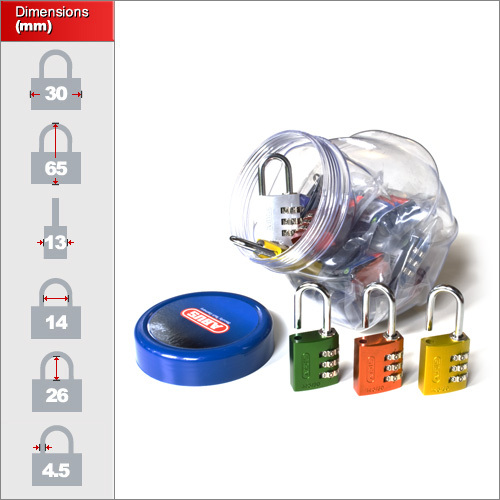 The sweetie jar option for these aluminium combination padlocks is ideal for counter tops, school shops and trade stand. Each one comes with a small cardboard pop-up which attaches to the top of the jar enabling you to display a message or price. Buying in this way saves as opposed to buying the padlocks individually. 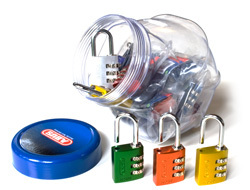 The jar contains 20 of the 30mm padlocks in various colours which inlclude, silver, red, blue, green, yellow, orange, brown, lilac and titanium. We cannot gurantee the exact quantities of each but they are evenly distributed. The padlock is a new development in the padlock market. An aluminium combination padlock with a hardened steel shackle which is both lightweight and secure. We only have the 30mm types in the sweetie jar option but we do we stock both the 20mm and 30mm versions of the ABUS 145 Series padlock seperatly. The 20mm version tends to be used for luggage and laptop bags while the 30mm is better suited to lockers, larger bags and even doors.